Happy Thanksgiving from our family to yours! 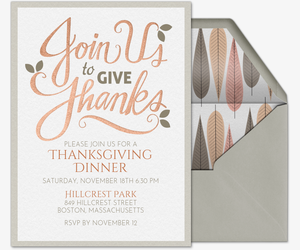 Treat your loved ones to a special Thanksgiving Day with free and Premium digital invitations from Evite. 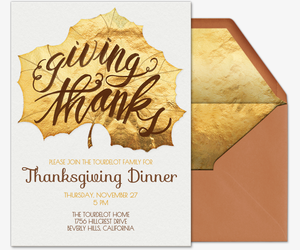 Our new line of handcrafted Thanksgiving invitations make hosting easy. Plan a Thanksgiving feast, potluck, or gratitude dinner, go to the parade, watch the football game together, grab drinks the night before, or reunite with friends for Friendsgiving. Evite has fall-themed designs for all your Thanksgiving weekend activities and more. 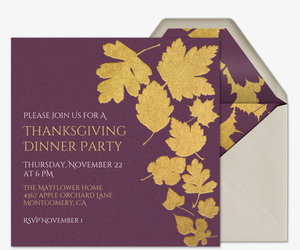 Paperless invitations keep the holiday stress to a minimum. Ask guests to contribute food or drinks using our “What to Bring” tool. Then, track your RSVPs, manage your guest list, share photos, and post comments all from one event page -- and follow along from anywhere using our mobile app. Giving back this Thanksgiving? Add a charity of choice to your Evite invitation for guests to donate to using the Evite Donations feature, powered by Pledgeling. For this special holiday, choose a Premium invitation. 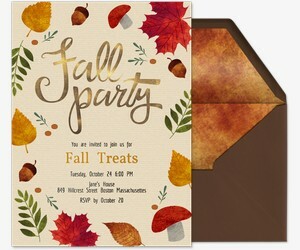 Evite’s advertisement-free Premium invitations offer the same look and feel as traditional, printed invitations. Premium invites come with envelopes, stamps, and additional photo or text cards. Don’t forget, you can also design your own invitation by uploading a personal design onto one of our pre-made templates. Discover new spins on Thanksgiving traditions at ideas.evite.com. Check out our holiday recipes and menus, DIYs, decor ideas, games, planning tips, and printables for both Thanksgiving and Friendsgiving. Plan the rest of your fall treats and holiday events with Evite, too -- holiday parties, Christmas parties, New Year’s Eve parties, and more. Evite also has online invitations for your personal milestone occasions (birthday parties, weddings, baby showers, bridal showers) and your get-togethers, as well (dinner parties, housewarmings, happy hours).